Why is Temperature Class important? If you have ever bought or specified explosion proof equipment from Pyroban, you will have a been asked about the Temperature Class. But why is Temperature Class important and how does it affect Pyroban equipment? Temperature classifications are referred to throughout the design process of explosion proof (ATEX) equipment and are often referred to as T Classes. The T Class is related to the auto-ignition temperature of the hazardous material. The auto-ignition temperature of a substance is the lowest temperature at which it spontaneously ignites. A Temperature Class is a term that is allocated within a hazardous area or zone to instruments and equipment. The classification or rating signifies the levels of thermal energy allowed in a particular area or produced by specific equipment. 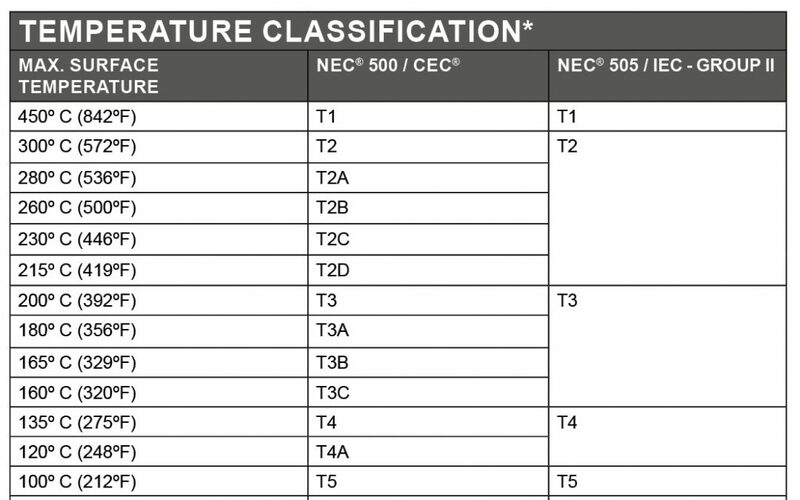 Temperature classifications or ratings vary between T1 and T6. This rating highlights the maximum surface or exhaust gas exit temperature that can be generated by equipment at a given ambient temperature (typically 40degC). For example, a rating of T1 means that the maximum temperature of equipment can be up to 450degC while a T4 rating would mean that the maximum surface temperature generated by equipment at room temperature cannot exceed 135degC. How does T class relate to Pyroban equipment? The operation needs to specify the T Class and Pyroban will develop the equipment to ensure surface temperatures are limited to the specified T Class. Motors, engines and any other hot surface on the equipment are controlled. If you’d like to receive your free explosion protection wallchart, contact the Pyroban team on info@pyroban.com. For more information, visit www.pyroban.com or call +44(0)1273 456800.